With these words, beloved, the hymnographer described the great event of Nativity. With these words, Kosmas the Melodist, son of this east, surpassed ages and times to tell about what he might chant and ask concerning the Nativity of the Lord Christ, messenger of love and spring of peace. The “Angel of great counsel” comes bringing to humanity the peace of the Creator of all breath. He comes to say to each one of us: “O man, who suffers all the preoccupations and afflictions of this world, come to me, to the Bethlehem, and put the burden of your weariness under my feet to find comfort and peace”. The grotto of Bethlehem is an image of the entire being of every human, who is fed by humility, strengthened by virtue, armed with passion and bearing the Lord inside. The Lord will sanctify his life. In these days, the peace of all creation, Jesus, comes to us. He is our peace and the medicine for the wounds of this east. He comes to us so that we might bury in his birth the sadness of the current year and open with His hope the next year. He comes to us with His peace. And His peace is a guarantee for the peace of our countries, the Church and humankind. We say to our people in these parts. We are messengers of peace and love, but we are, at the same time, deeply rooted in the history and the geography of this land. Our unique way, the true spring, is to meet the other, mediating to him his acceptance and the collaborating with him to overcome the difficulties and the burdens of this world. We are messengers of peace, but at the same time, we are not silent victims, bearing the blows of others without any kind of reaction. We are messengers of peace, love and acceptance of the other. Our way is peace. Our hope and message is of a concrete fraternity with those with whom we submit ourselves to God, the Almighty Creator of the heavens and the earth. The bells of our churches hung long times past will ring strongly and enthusiastically forever in spite of all conspiracies. These bells will keep ringing out our chime of love for the other, our fellow human being and neighbour. The same bells will announce to all the world that Apostles were sent out from here and their fellowship will be as a messenger of love and a strong root which will overcome in these difficult days. The Church which gave birth to confessors such as John of Damascus and martyrs such as the priest Yousef Haddad, (Joseph of Damascus), will not cease to be a messenger of love and peace. The same Church gave us several sons on the altar of country, church and humanity. To be a messenger of peace does not mean that one is a messenger of submission. We will not submit ourselves to those who destroy our holy places. We will not keep silent seeing the abduction of our bishops, Youhanna, Paul, and all the innocents of this land. We will not keep silent in the cases of those who kidnapped the voices of our peace; I mean, the nuns and the orphans of Maloula. We are invited to raise our voice, in the home countries and abroad, against those who want to kidnap the voice of our peace. The nuns and orphans of Maloula did not hold anything but candles of prayers. The bishops, our brothers, did not have anything but the voice of peace. Where is all the world in this and what does the world do for the light of the nuns and the peaceful message of the bishops? Our peace, O Lord, is a guarantee for our Antiochian Orthodox Church. She is invited, clergy and people, to approach all issues with spirit of love and meekness. Wounding the body of the Lord brings sadness to all. Our Church has many ways to deal with the weakness of each one of us, ways which avoid divisions in the body entrusted to our care. Our love for God and toward the other necessitates that we do not lose this substantial unity for personal and individual reasons. God condescended to come down and live among us granting us joy. The Lord lives in the calmness of our spirit and occupies hearts dressed with love. “Love one another … by this the people might know that you are my disciples” (John 13: 34-35). This love is not only essential for us, but it is essential for the world and in order to trust in God who moves us. And this is a great responsibility for all of us, if we really love Christ. The Lord says in the Gospel of John “that all of them may be one in us so that the world may believe that you have sent me” (John 17: 21). With this hope we receive the Nativity and we recall insisting that all our sons might possess the spirit of this hope. Our Church will be glorified and our Lord also, if we remove from our hearts the condemnation of the other. She will be glorified when we avoid filling the newspapers with threats and resolve our issues through the logic of love and acceptance of the other, and that is exactly the logic of the Gospel. Our Church will be glorified and also her Bridegroom when we, pastors and people, are one body, one heart, consoling the sad and being ideal persons for the world. 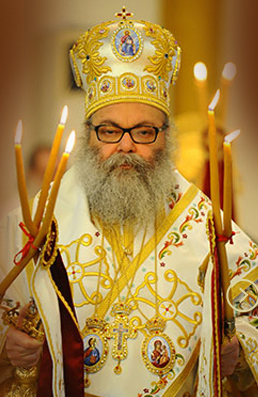 From here, from the heart of the Mariamite church of Damascus, I send apostolic blessings to all our spiritual sons and daughters in the home countries and abroad. I pray to the Baby of the Grotto to remove the tears of the sad, to counsel the hearts of the refugees, to have mercy on the souls of the departed and to embellish the New Year with the return of those kidnapped and with His divine peace. May God protect Syria. May God protect Lebanon and protect them as countries of peace and peaceful common living. May God protect the East and all the world. May He grant you blessed feast days in which all is transfigured with his Divine and true peace. On the 20th December 2013.